You know issues with case sealing equipment can bring packaging operations to a stand-still. In today’s busy manufacturing world, there’s just no time for downtime. 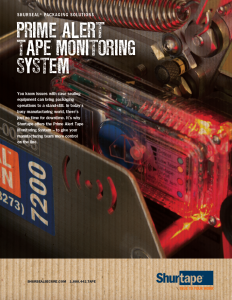 It’s why Shurtape offers the Prime Alert Tape Monitoring System – to give your manufacturing team more control on the line.